One of the fastest growing segments of firearms owners are those who are buying guns for the first time for concealed carry and personal defense. This has led to a market explosion of small caliber, lightweight pistols that are very easy to carry. Unfortunately they can be difficult to shoot and many new owners are carrying them without training on how to shoot a small pistol. If you have one of these small carry pistols and are having some difficulty shooting it, don't give up. It will become much easier with some smart practice and a few tips. This picture from The Well Armed Woman is a great example of two common "bad" grips and one very good grip. They talk more in-depth about this issue at the link. A firm, proper grip on your gun is essential to all types of shooting, but is much more noticeable on guns with more recoil. Even though little guns are typically chambered in calibers that produce more muzzle energy, they have much less mass to hold them in place and a much smaller surface area to distribute the recoil into your hand. This combination causes recoil that many shooters find "Sharp" or "snappy". A proper grip on the gun involves having both hands supporting as much of the grip as possible. 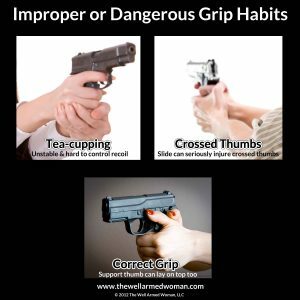 Both hands should be reasonably firm - most guns don't require a white knuckle hold. You want to think of your hands as a vice grip or clamp to support the gun and lock it in place under recoil. The time from pulling the trigger to the round igniting is too fast to humanly respond to, so the time to have control of the firearm is before the trigger is pulled. Your hands should be "nested" together, supporting each other and the grip of the gun. Your supporting hand should not "teacup" the gun, wrap a thumb behind the gun, or grab the wrist of the shooting hand. Both thumbs should point forward in the direction of the gun, with elbows and wrists locked. Doing all of these at once may feel unnatural, but it's important to keep reinforcing these habits until they are instinctual for you. Smaller guns create greater misalignment errors, meaning every mistake you make is amplified compared to a full sized gun. They also tend to have stiff, long triggers which do no favors to the users in ease of use. Your pocket pistol will never be a target pistol and only a marginal amount of accuracy can be expected out of most of them, but this is no reason to get sloppy on the mechanics and practice of firing the gun. It is true that most defensive uses of small pistols will be at very close range where the person carrying the weapon will only have time or space to point the pistol and fire it rapidly. In my opinion, this is a poor justification for a new shooter to ignore shooting fundamentals in favor of "mag dumping" at close range targets. Anything you can do slowly will naturally come faster as you practice, yet anything you only practice at high speed will almost always result in sloppy technique and poor habits. Practice getting the right pull, every time. Do it as slowly as you need to and focus on the result of each trigger pull. Eventually, as you become more comfortable with the basics, you will be able to pick up the speed without sacrificing your technique. This is the point when you should start experimenting with the more advanced techniques, not before. One of the biggest problems with shooting sub-compact pistols is that the recoil tends to be very unpleasant. Continuing to shoot against your natural instincts will create the association in your mind that a trigger pull equals painful recoil. This can easily create a flinch response, which is one of the worst conditions for your accuracy. The cure for flinching is to continue to practice pulling the trigger mindfully without the experience of the sharp recoil. One of the best ways to do this is through dry fire practice, where an unloaded gun is "fired" in the same way that it would be at the range. In dry fire practice, you focus on perfecting the fundamentals of every trigger pull to make it a habitual motion. By dry firing at a much higher volume than your live fire, you will reinforce fundamentals and also slowly remove the flinch response to pulling the trigger. This is an exercise that becomes more effective over time, but should be repeated regularly. Even the best professional shooters will occasionally develop a flinch, and nearly all of them engage heavily in dry fire practice. Snap caps are a great accessory for dry fire. Snap caps are designed to prevent dry fire damage to your gun, and are easily recognizable as different from live ammunition. Another great option, where possible, is to get a rimfire trainer version of the gun you're trying to shoot (or a .22lr conversion kit for your gun). Rimfire guns provide all the advantages of dry firing with the added benefit of cheap, low-recoil live fire practice. Getting away to the range can be difficult and time-consuming. Depending on how lucky you are in your proximity to facilities, you may have many things to contend with; the commute, waiting for a lane, range fees, and other hassles that get in the way of the shooting you want to do. It's normal to want to take advantage of the range opportunities we do have. This can mean burning up a lot of ammo in one trip. I generally advise against this, especially when dealing with guns that can be challenging. The reality is that the muscles used in holding a steady grip take time to build up and will wear down quickly for a beginner. It's best to start with short range sessions (around 50 rounds) and build up. When it comes to shooting pocket pistols that can have a painful recoil impulse for any shooter, I generally find that it's best to keep your round count low and meaningful for every practice session. If you feel that your hands are starting to hurt every shot, you're not paying attention to the basics, or you're having to convince yourself to pull the trigger because of the pain associated, it's time to stop. Rather than helping you become more proficient, continuing past these points will create and reinforce negative habits that will impede further progress. Another suggestion is to take an easier-shooting gun (preferably a .22) with you. Start your shooting session with a slow warm-up from the .22, focusing on trigger pull and sight alignment. Once you're in your element, switch to your smaller gun. If you feel your focus slipping, switch back to the .22 for a while until you're ready to go back. Hopefully this post answered some questions about shooting compact carry pistols. Still having trouble or have further questions? Feel free to comment below, send me an email at dakota.potts@gmail.com, or find me on Facebook and ask me there.